Ruth, this one is further away, but a lot easier to hike. Your kids will speed thru it like a nintendo game. 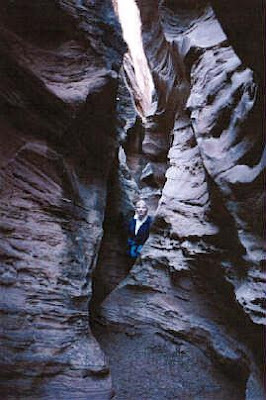 It is an actual slot canyon that you can walk into that looks just like the picture or better, you don't have to kill yourself getting there, and it will be FUN!!!!! Might even want to camp out there. Goblin Valley is somewhat of a wonder in itself.